Emerging T.O. : Are suburbs really dead? Many books and reports have come out in the past ten to fifteen years regarding the death of the suburb. 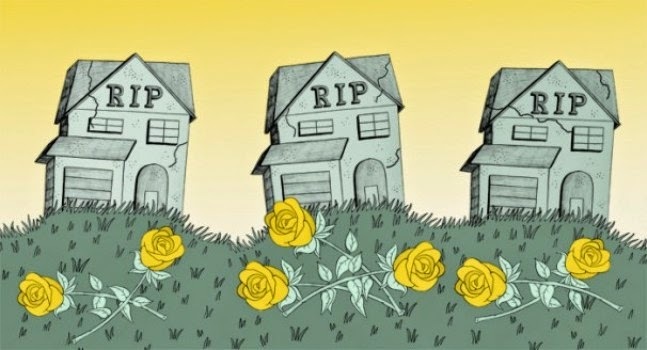 There's "Death By Suburb", "Death of A Suburban Dream" and "The End of Suburbs" to name a few. Of course, many of these books focus on the American city and how their inner suburbs are failing as opposed to the outer suburbs which are often still growing in successful cities. The suburbs came into prominence after World War II, though the existence of suburbs have been around well over a hundred years. Returning war vets came home and purchased a slice of the good life. Buyers back then craved spacious homes, large lots and trees where there was generally a low crime rate and decent schools. The city centres at this time became a place where minorities would go whether they were poorer folks, outcasts or new immigrants from other countries. So, what happened? Well, in the 80s and 90s young university-educated adults started returning to the cities in great numbers attracted by jobs, and the urban culture which was often a reflection of the immigrants and outcasts who came before them. Plus, in growing cities like Toronto, the commute became too long. You couldn't be done work at 5pm and expect to be at the dinner table by 5:30pm like when Toronto was much smaller. We have seen the number of city dwellers explode in the past twenty to thirty years. Toronto, and most growing major cities now have a thriving downtown. The suburbs no longer pull businesses and wealth away from the city. In many cases, it's the opposite. Strangely, Toronto's downtown never quite lost its appeal. It always maintained a village atmosphere and never had the flight from downtown that many American cities had. Still, the big return to the city centre has changed this city too. And we have the condos to prove it. It would appear that suburbs do not serve the purposes they once had, and now they are even more expensive for municipal governments to support because of their low density. There are simply just not enough taxpayers to go around. At a quick glance it would seem that the suburbs are doomed. But wait! What was the fastest growing city in Canada last year per capita? Toronto? Calgary? Edmonton? Nope. That would be Milton, ON, a suburb of Toronto. So, the suburbs are not dead yet. They just serve a much different purpose than they used to serve. In my opinion, there will be some suburbs that will deteriorate and ones that will not. Many of the outer suburbs have a better shot because they serve a purpose right now. The reasons many people are going to the suburbs have changed. Now, it is because many buyers cannot get the space they want in the city. Plus, it's hard for places like Toronto to grow when the city has limited land. Suburbs are not the promised land, but a compromise for buyers to find space while understanding they may have a long commute if they work in Toronto. Suburbs have not really changed with the times though. The problem with suburbs is their poor design. They often lack good public transit and mains streets for people to form communities. As an investment, it has become a greater risk than the city. Cities are becoming more affluent and location is key to your investment. In the suburbs, you need to invest wisely. There are rich suburbs, like Oakville. There are new suburbs for the middle class like Milton. Increasingly, there are suburbs where the poor are being pushed toward. Not just the usual neighbourhoods like Rexdale or Jane and Finch, one of the few Toronto pockets where real estate prices have not increased in recent years, but there are increasing poverty rates in Mississauga, Brampton, Oshawa and Markham. To make things more complicated, there are suburbs like Etobicoke that were once a small town, then a suburb, then part of the city of Toronto. Even within Etobicoke, the change varies widely. Many parts of Etobicoke below the 401 that are becoming more city than suburb. There is higher density and still decent access to Toronto. The same goes for Scarborough. Some parts of Scarborough would be a poor investment area, others would be great with access to the highway, the lake and the city. It's much closer than Milton! In the end, location is becoming more and more important. It's not as simple as the further you go from the city, the cheaper housing will be, though there is some truth to that. You need to be in a neighbourhood with some potential or some current success, or a walkable main street, a community hub, something distinctive and appealing, or you need to be on a transit line or future transit line. The suburbs are not what they used to be, but some are alive and thriving. People are still going there... at least in some suburbs. In others, the suburban dream is over, like an old amusement park or an abandoned mall. Their time has passed. Discount Brokerages: Are They Worth It?